The Saturn™ ST-1100 is our best selling, most affordable tabletop strapping system. Just dial in the strap length and the strap tension and you’re ready to go. Loop the strap around the product and insert it into the machine. The strap is automatically tensioned, cut and heat sealed. Another length of strap automatically feeds out for the next product to be strapped. Easy-to-use controls include illuminated on/ off switch, reset, strap reverse, strap feed, strap length, and dial for strap tension adjustment from 10 to 100 pounds. Engineered for flexibility, allowing you to use any polypropylene strap from 1/4” to 5/8” wide. Adjustable table height from 29” to 32”. Locking casters for portability to move anywhere. Dependable design provides years of reliable service with low maintenance costs. 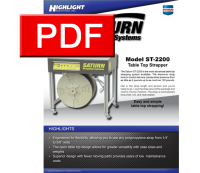 The Saturn™ ST- 2200 is the most advanced tabletop strapping system available. The electronic strap tension control delivers precise strap pressure from as little as 5 pounds up to as much as 120 pounds. Dial in the strap length and tension and you’re ready to go. Loop the strap around the package and insert it into the machine. The strap is automatically tensioned, cut and heat sealed. Another length of strap automatically feeds out for the next product to be strapped. Easy-to-use controls include illuminated on/off switch, reset, strap reverse, strap feed, strap length, and precision electronic dial for strap tension adjustment. Engineered for flexibility, allowing you to use any polypropylene strap from 1/4" to 5/8" wide. Adjustable table height from 29" to 31". Locking casters for portability to move anywhere. Superior design with fewer moving parts provides years of low maintenance costs.